The Stade Ferhan experienced another day of silence as South Africa and Ghana humbled Algeria in the boys and girl’s category respectively. Matchday 3 commenced with Zambia facing Nigeria in the men’s category. The Nigerians were aching to make it two wins in succession with Zambia also aiming to top the table. Mulenga Dominic struck for Zambia as early as the 3rd minute. Skipper Mubanga Joseph increased the tally 60 seconds later to dent the hopes of Nigeria. The boys in green fought very hard but failed to change the scoreline as Zambia won 2-0. Namibia leapfrogged Zimbabwe into the second position with a 3-1 win over them. Zimbabwe went ahead through Kamusewu Tadiwanashe’s stick in the 9th minute of the game. The lead lasted for a minute with Namibia’s Neethling Nico restoring parity. Nico got his brace after the break to give Namibia the lead for the first time in the match. Namibia’s Rieckert Henco cemented their dominance in the 13th minute to lead by 2 goals. O’Riordan Tony reduced the deficit in the 16th minute but the 2 goal lead was restored three minutes later courtesy skipper Van de Merwe and Jan de Villiers scoring. Match ended Namibia 5-2 Zimbabwe. Perter Jarvis made the headline in the third game with a five-star performance as South Africa beat Algeria 9-0. 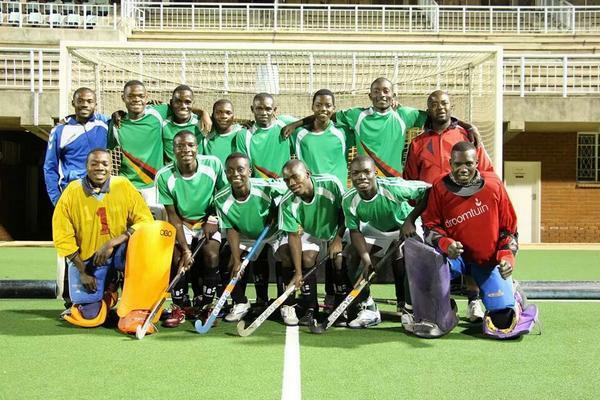 Algeria making their first appearance in any hockey tournament improved their performance in their third game against the continental giants. The tournament’s top scorer got his brace within seven minutes after Campbell Jared and Maphumulo Mpumelelo had given South Africa a 2-0 lead. Jarvis scored in the 6th and 7th minute to make it 4-0. Maphumulo Mpumelelo got his second and South Africa’s 5th before Lewis Matthew made it 6-0 in the 15th minute. Jarvis finally got his hat-trick in the 16th minute and added his 4th and 5th in the 19th and 20th minute to complete the 9-0 win. The Algerian boys were enthused with their performance as it marks their first participation in hockey. Namibia and Zimbabwe engaged in a 6 goal thriller in the first game of the women’s category. The match was tied at halftime. Myburg Taramarie put Namibia in front in the 5th minute before Dobbie Ruvimbo levelled for Zimbabwe three minutes later. Namibia went 3-1 up after the breakthrough of Van Rooyen Joane and Cormack Kiana-Che in the 11th and 14th minute respectively. Zimbabwe responded quickly with an Alexi magic to reduce the deficit in the 16th minute and Terblanche Natalie getting the equaliser a minute later. The match ended Namibia 3-3 Zimbabwe. South Africa continued their winning streak with a 7-0 win over Nigeria. An entertaining, pulsating game saw both teams rue chances in the early minute. South Africa made-up for their early miss as De Waal Kayla got the opener. Welham Angela scored a quick brace to make it 3-0. Jean-Leah Toit added the fourth and Kayla made it 5-0 in the 17th minute. Welham scored two goals in the final two minutes to send her personal tally to nine goals and the tournament’s top scorer. In the last game for matchday 3, a rejuvenated Ghanaian squad scored 13 times and handed Algeria their 3rd defeat in three games. Asana Gbati put the West Africans ahead with two goals inside the first two minutes. It was 5-0 in the 5th minute as Ghana averaged a goal per minute. Otoo Eleanor, Quayson Racheal and Copson Hagiet the scorers. Asana grabbed her hat trick and added her 4th in the 7th minute. Akoto Charity also got her name on the score sheet to end the first half 8-0. Charity continued from where she stopped as she scored her brace a minute into the second half. Eleanor was back on the score sheet in the 14th minute with Charity completing her hat-trick two minutes later. Asana Gbati and Okine Dede completed the 13-0 victory with a goal each in the 17th and 18th minute respectively.